Spyderco Tenacious Plain Edge Folder. Being tenacious means one holds fast. One is persistent and cohesive. It means being tough and tireless until achieving your goal: all knife-worthy definitions for a worthy knife. 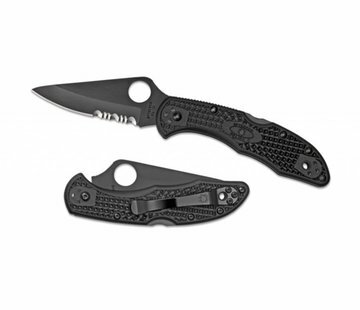 The mid-sized Tenacious has a black G-10 laminate handle, milled with prolonged fatigue-free cutting in mind. Tucked inside are skeletonized steel liners increasing the handle's rigidity and strength without adding non-functioning weight or bulky thickness. The 8Cr13Mov stainless blade is leaf-shaped and ground flat from spine to cutting edge for cutting performance. 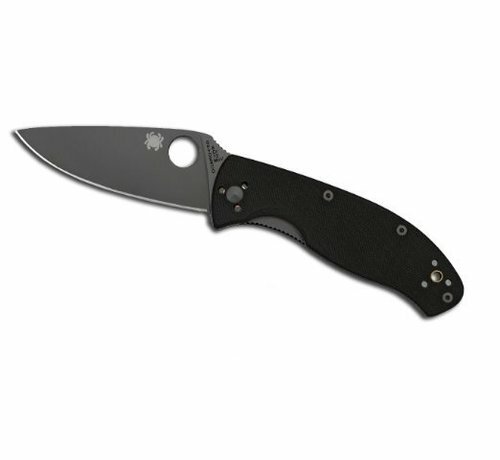 The blade's shape coupled with an oversized Spyderco Round Hole and textured spine jimping allow you to open the blade and position your thumb on the spine in slip-proof confidence ready for work. A Walker Linerlock (with jimped liner) and a 4-way pocket clip lets you set your carry and draw preference: Tip-up/tip-down left-hand/right-hand. Screw together construction.